Fourth Row Center: Film Writings by Jason Bailey: On TV: "Semper Fi: Always Faithful"
Semper Fi: Always Faithful tells his story, and the story of those who worked with him to bring the Lejeune bombshell to light: Major Tom Townsend, whose son died at six weeks; Mike Partain, born on the base, who battled male breast cancer; and Denita McCall, who served on base and later succumbed to cancer. The film, directed by Tony Hardmon and Rachel Libert, is equal parts personal story and investigative account, and the filmmakers get the proportions about right: it is full of shocking facts (as many as a million people have been exposed to contamination over the thirty-year period in question), but the data does not overwhelm the real people involved. Chief among them is Sgt. Ensminger, a sturdy and honorable man who will not go down without a fight. The deeper he digs, the more outraged he becomes. The USMC, at least at Fort Lejeune, doesn’t come out of the film smelling too good; after first attempting (and, for many years, succeeding) in covering the contamination up, their “representatives” now insist that contacting everyone who served there would be impossible. It’s their “top priority,” though, they insist. They’re not the only guilty parties; part of the battle is to get the contaminants in the water (specifically TCE) classified as human carcinogens, but when Ensminger and Partain attend that hearing, they are treated to a series of chemical lobbyists insisting that the data is inconclusive. It’s a shameful display, which the filmmakers present without explicit comment. They don’t have to say anything. This scum speaks for itself. The film gets to you like that—it’s equally fuelled by a sense of moral justice and righteous indignation. We identify with the victims and are moved by their stories; a series of them testify before the National Academy of Sciences, who are launching a study of the area, and one woman unpacks a box of the clothing, which is all that remains of the baby son she lost. “We are not numbers in a study,” she tells them, her voice shaking. “We are human beings who have had great tragedies.” That rips you up; so does the simple scene, not long after, when Ensminger talks about losing his little girl. 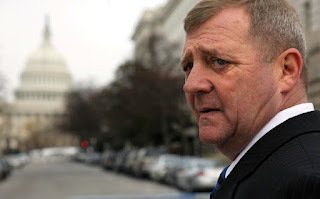 His perseverance is rewarded, later in the film, when the House introduces “The Janey Ensminger Act,” requiring health care for those affected by the Lejeune contamination (it is, of course, currently stuck there). The Marines are reaching out to more possible victims. The bombshells that Ensminger, Thompson, and Partain uncovered have received national attention. And they continue to fight. There are over 130 contaminated military sites, which, according to the film, makes the Department of Defense our biggest polluter. “Camp Lejeune is just the tip of the iceberg,” Ensminger says. Semper Fi: Always Faithful is fairly standard from a stylistic point of view; it breaks no new ground cinematically, mostly using talking heads, fly-on-the-wall footage, and document pulls. But the narrative is so riveting, it hardly matters. The title of the film comes from the Marine Corps motto, Semper Fidelis—which, to Ensminger, means “that we take care of our own.” That’s what he’s done; that’s what he’s continuing to do. Semper fi. "Semper Fi: Always Faithful" airs at 10pm EST tonight on MSNBC.